I’ve been sent some more CiM limited editions to test! I believe some if not all of these will be available in the UK fairly shortly. Jellyfish is a colour-shifting lavender. It looks bluer under halogens and pinker under incandescents or sunlight. It is also a very close match in colour to Effetre dark lavender, which is becoming increasingly hard to get hold of since Effetre haven’t made any new batches in a while. 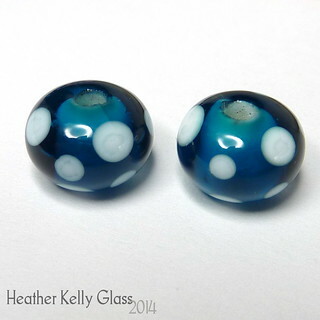 The round bead is a jellyfish core, then Double Helix psyche and encased in jellyfish. I can’t say whether it’s the same effect as you get from dark lavender and psyche (anyone around who uses that combo often? I’m still bad at keeping psyche reduction under encasement), but the electric blues from the psyche are pretty good, and if you want a dark lavender-alike for the colour on its own, then this would definitely be up your street. A lovely deep teal blue. Sadly, it seems to have incompatibility issues when encasing white, which is a real shame because the combo looks great. These two are Effetre white and you can see multiple cracks. The next day I made another two, one with peace and another with Effetre just to make sure I hadn’t done something stupid. In this case, the one with peace has the crack, running into the dot, centre right from the top of the bead – the Effetre hadn’t yet at the time of taking this photo, but I wouldn’t be at all surprised if one turns up in a few days. Incidentally, you can see the difference in density between the peace and Effetre white dots – peace is less bright and has more noticeable rings inside the dots. The heart is marine over Effetre white, gravity swirled. Even with the colour this thin, there are cracks (and very definitely incompatibility ones, at that). From another angle. The crack comes down from partway through the top lobe, then changes direction towards us. That ain’t thermal. I’ll need to try it over a few other things – I am guessing light opaques like dirty martini may be ok to use as a base as that’s a bit stiffer. Still a shame! A pretty transparent green. I haven’t put it side-by-side with any of the other greens yet. I made two pairs of earrings this week. 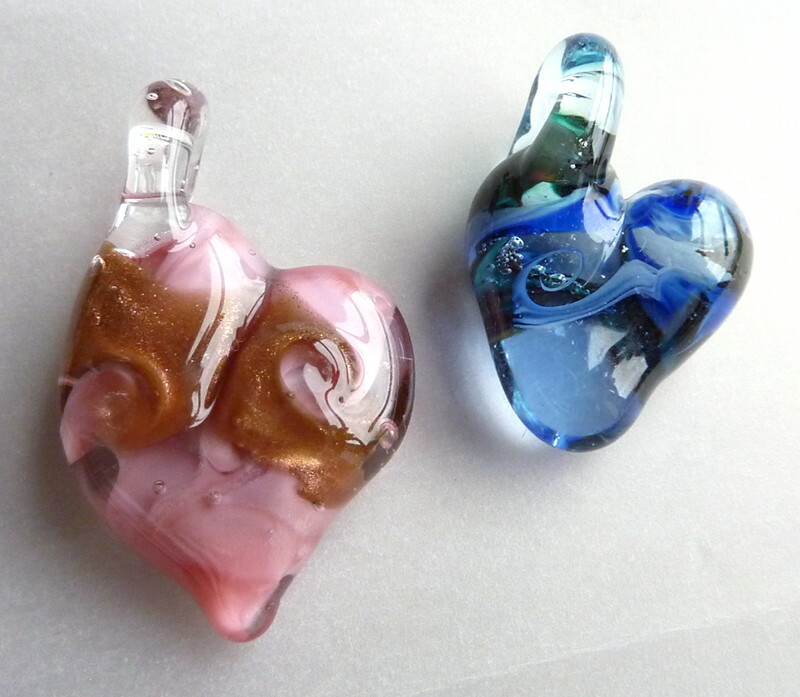 First I made a pair of little lampwork hearts with the luscious Lauscha transparent red (I love this, it’s actually semi-opaque when used in any volume, but keeps a whole lotta depth and juiciness). 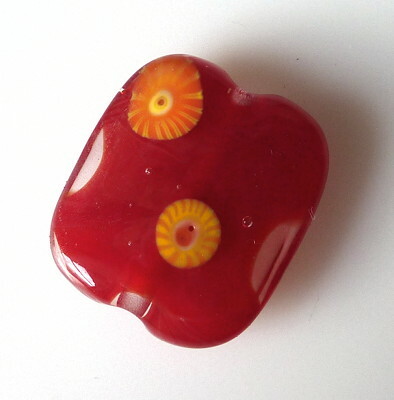 Red lampwork hearts by me, sterling silver. 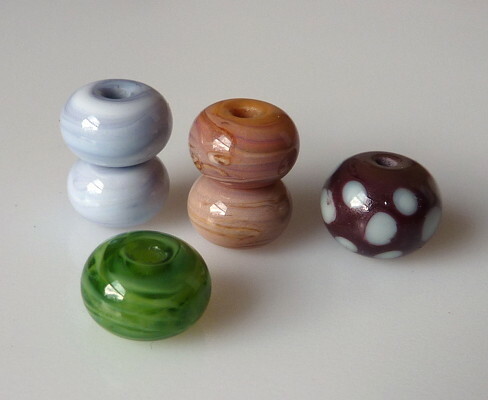 I had another go with my rubber tube – I like spirals so made some with the frosted lime tubing. I had some little o-rings in tangerine that fit on the tubing so added those for some zing. 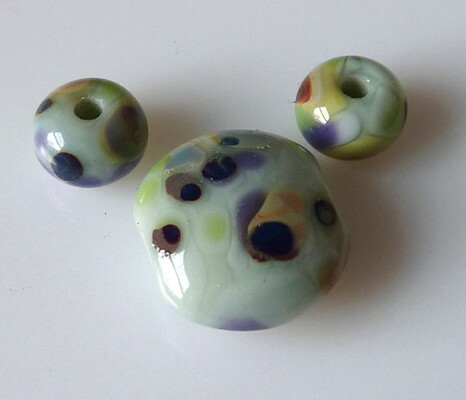 Then I decided that I wanted little lampwork dangles in the centre, so made a pair of orange and green encased dotty beads. 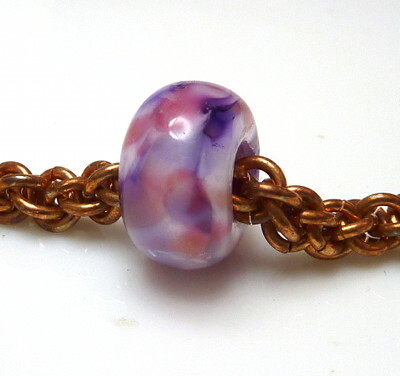 I messed around a bit with different types of endings on the brass – tried some spirals but didn’t get them centred in the orientation I wanted, so in the end I went for a hammered widened end and added a little green seed bead to stop the lampwork sliding off. 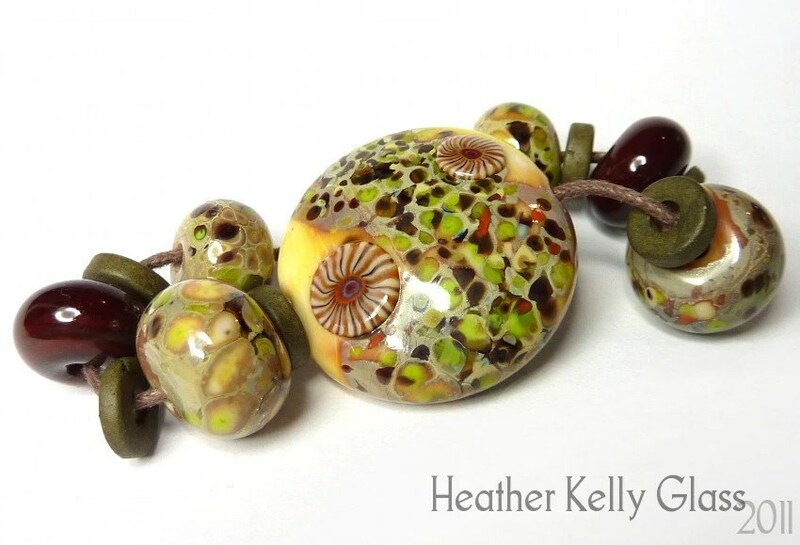 Green and orange dotty lampwork beads by me, lime rubber tubing, tangerine o-rings, brass. I think these could look good in a bunch of different colours. 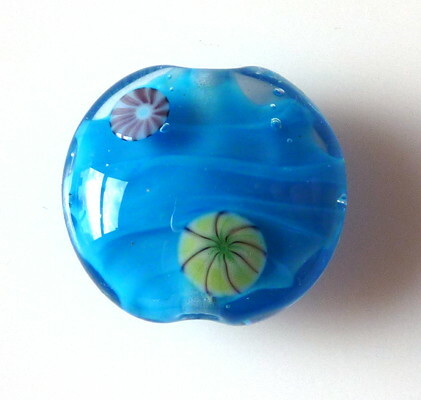 Beads by Terri, GlassOwl and Anna (ShinySnail). Anna’s is sparkly and I have a suspicion may involve the fabled pineapple sparkle! Here are the beads I sent. 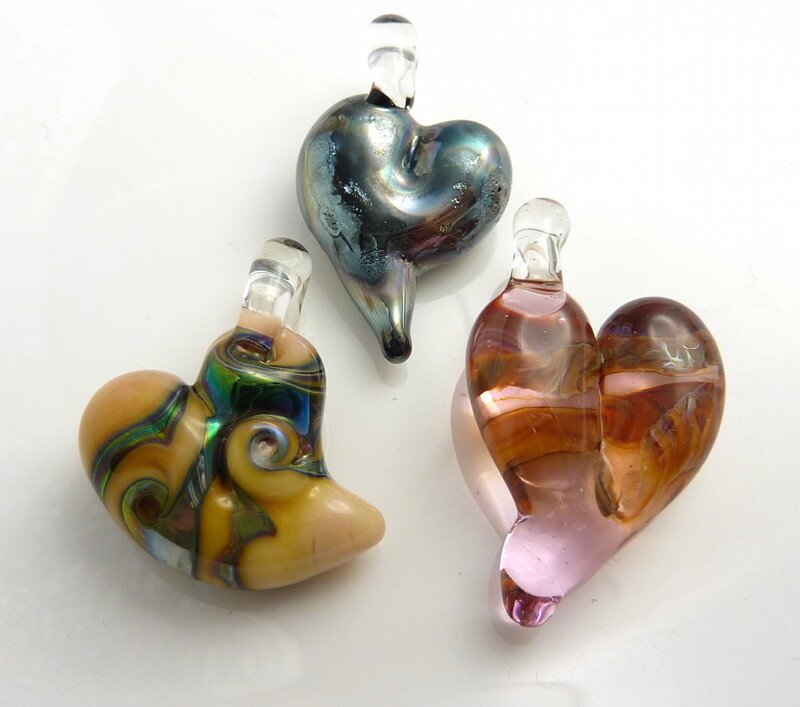 Three off-mandrel hearts. 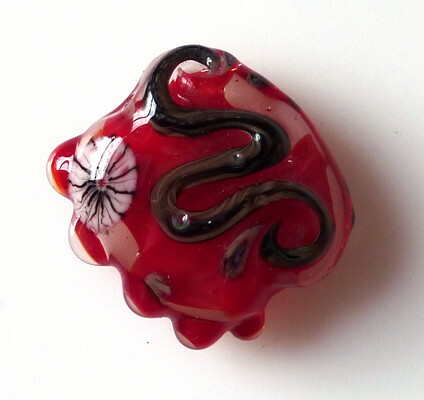 One in Lauscha transparent pink with a silver glass twistie. One in Lauscha caramello with psyche. One in Plowden & Thompson black, which goes metallic. I gave extra heat to some areas so it developed some surface texture. 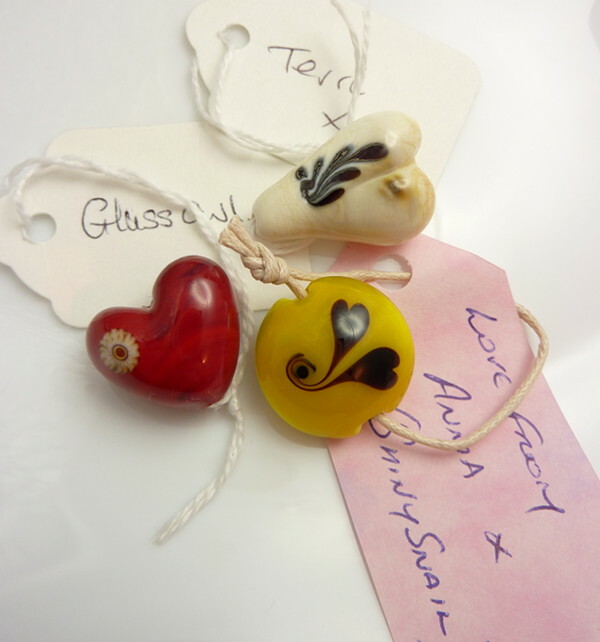 I resolved to take part in more Frit-Happens swaps this year – it’s lovely to get little packages through the post with surprise glass beads in them! I also find that swaps get me doing new things – I don’t think I would have spent nearly as much time making hearts if not for this one and I’ve really enjoyed it. 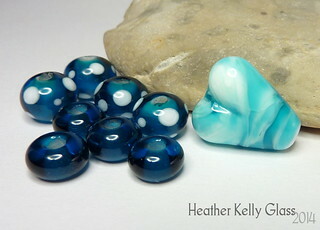 (I am also confident now that I can make beads of good enough quality to send out to other lampworkers! Which can be the scary bit). 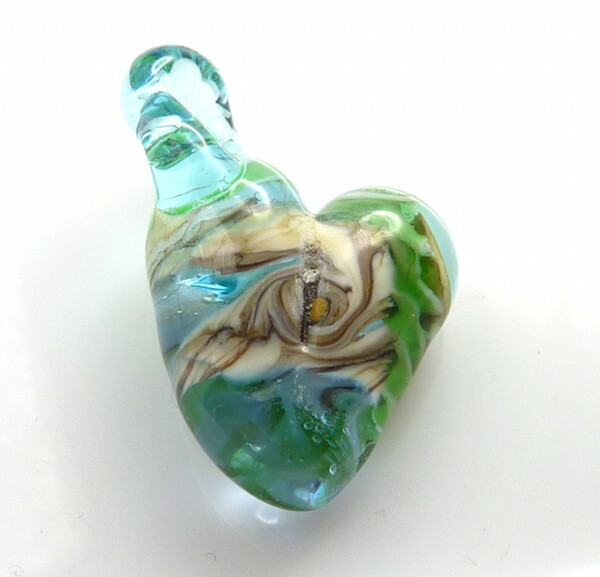 Serendipitously, Holly of Holly’s Folly Glass posted this off-mandrel heart tutorial and I thought “Ooh, that looks interesting” so I went off to have a go. First try! I used a thick rod of transparent pale blue for the base and added twistie ends in neutral and green. I twisted the centres, shaped the heart end and added a loop in baby blue (tricky!). Then I held the heart in my reverse-action tweezers, not the loop, in case it might shock. I took off the rod and heated the end to round off, then tried to put the heart into my kiln… but the tweezers wouldn’t let go! So I stuck it in my annealing bubbles to cool down. My tweezers have very thin pointy ends, and one of them had got embedded in the glass. I hadn’t put them in the flame, but I most have got them too hot anyway because it was well and truly stuck. In the end I just bent off the tweezers, so now one of the points is shorter than the other, and the remains are still in this bead… After this, I used my needlenose pliers instead and always hold the loop! 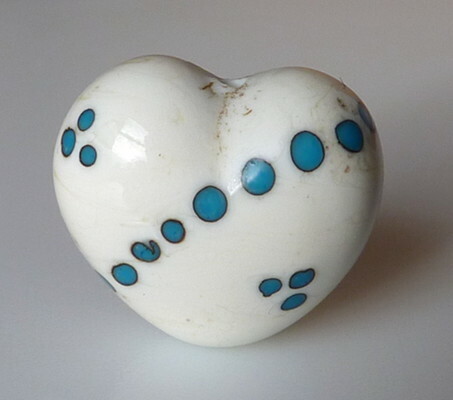 I made heart 2 (the blue one below) in the same way, without the mishap. Then I read Mr Smiley’s heart tutorial (there are pics later on in the thread) and I made more… and more. They’re fun and rather addictive, but I still find the loops tricky! 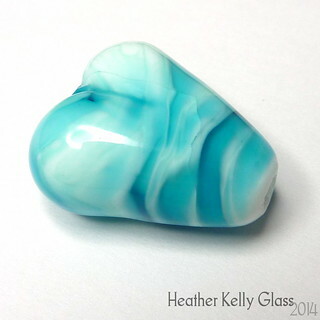 Blue heart: pale blue with a blue twistie and a green+brown twistie. 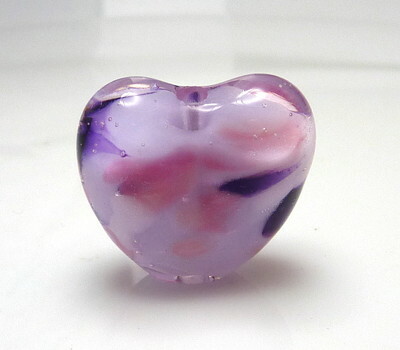 Pink heart: Reichenbach mystic pink mixed about with Lauscha soft clear. Goldstone ribbon on the surface and encased. The shape has a bit too much on one side for my liking. 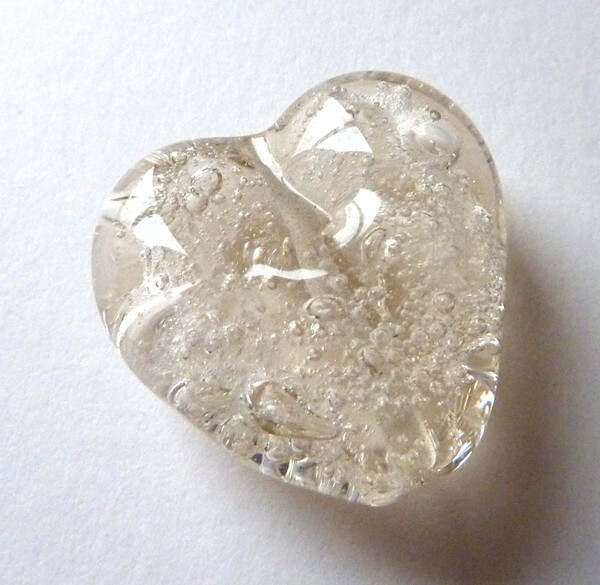 This heart is Lauscha citrine with my red roof tile twistie. There were a couple in between the pink heart and this one, but they’re off to the Valentine’s swap so I won’t show them yet. The RRT twistie hasn’t been a great success – basically it may as well be RRT and hades only, because those are the colours that take over. I really like this one. It’s a white opalino base with coe 96 raku frit. I didn’t strike the frit properly, though I did get the opalino hot enough that it’s started displaying faint black spiderwebbing in places. Neither of which I mind – I think it gives it a delicate look, and the muted colours go well with it. 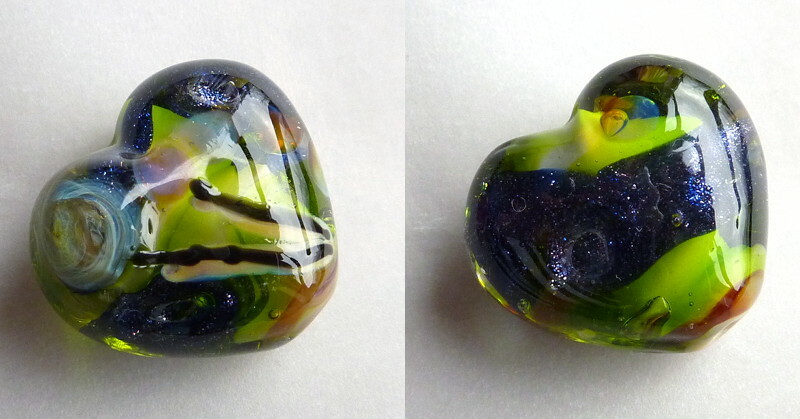 Another thing I’ve been doing recently is heart beads. 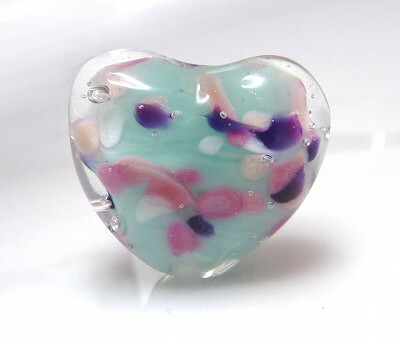 Lots of heart beads. 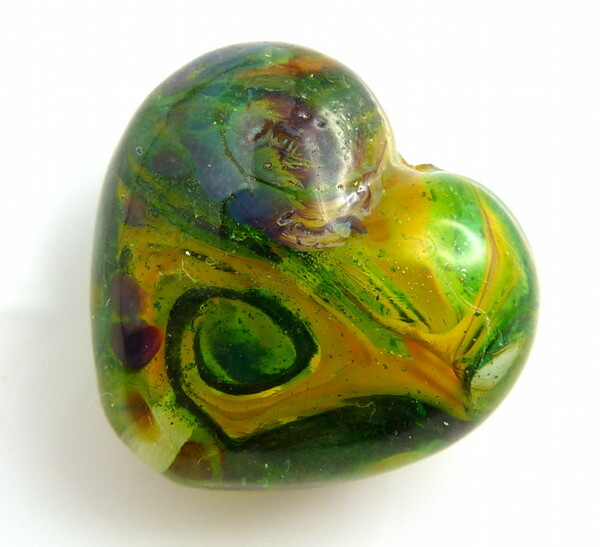 We’re having a Valentine’s bead swap on Frit-Happens so I made a whole bunch and chose 3 of my later ones to send in. Piccies of those and what I received when I get them! Firstly, these are made with my Carlo Dona heart press. This is Lauscha champagne, which is a very pale transparent. I used bicarbonate of soda to make the bubbles. I made this a tad too big for the press, so it’s shaped by pressing and also by hand afterwards. 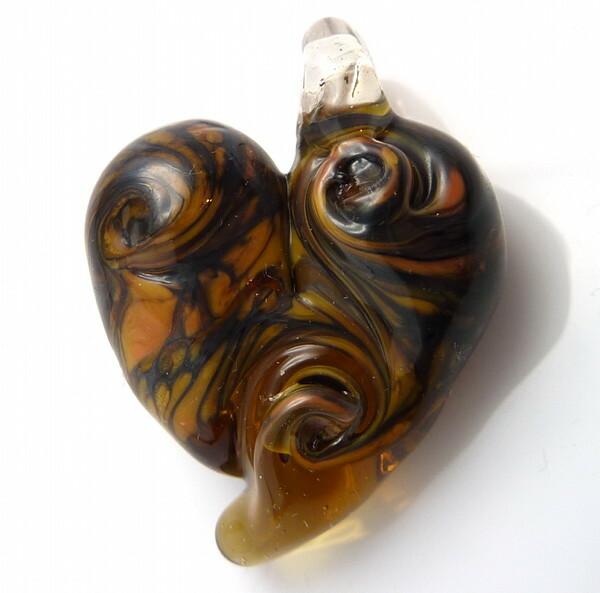 Then I did these, which I am calling Mysterious Hearts of Gold. 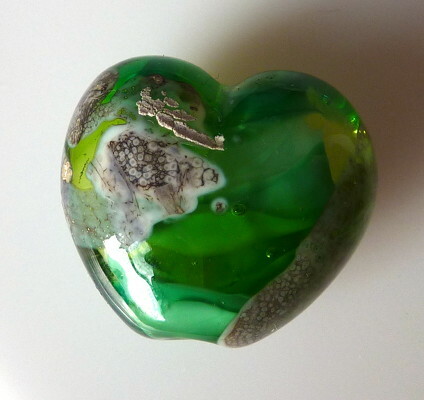 I made the core of this with shorts in clear, yellow and green, then sprinkled some green aventurine frit, added more clear and a little pulsar, pressed it, and added raku spirals and dots to the surface. 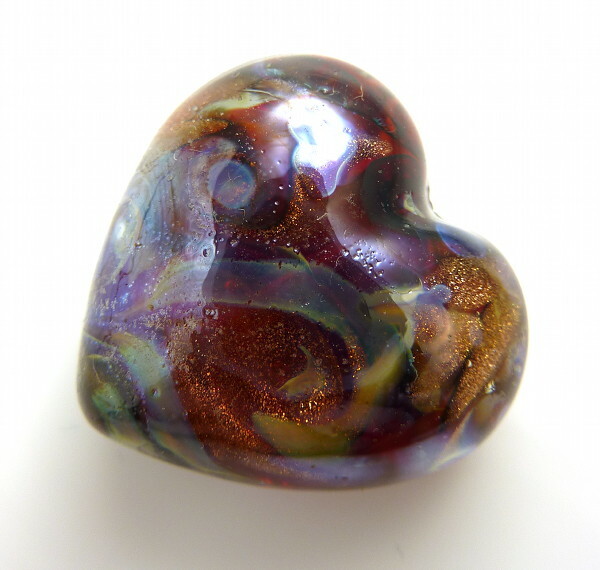 I was very pleased with the result – these hearts have a lot of depth, and the sparkle and randomness means you can spend a while staring into them. 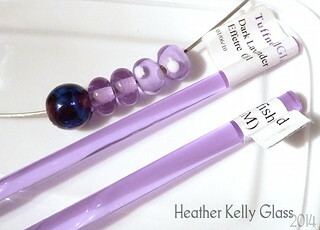 Also a great way to use up your ends of rods! Love this one. It’s the same idea but has amber and sangre shorts and goldstone frit. Some raku stringer again, a red encased twistie one one corner and a few dots and lines of aurae. This one… is not so good. I didn’t really think about what effect doing the core this way would have – it’s dirty martini with transparent green on top, then clear and a bit of bluestone ribbon. I have put deep twists in the ribbon in places, though they don’t show up too well here. I think the width and concentratedness of the ribbon doesn’t work as well as the frit in the other hearts, and the lime green and blue is a bit garish. I also totally messed up the surface decoration – it has terra 2 dots and a wrap at the borrom (which is showing up as reddish brown, clashingly) and some stormed supernova on one front lobe, which I left a bit raised and just serves to make the heart shape lumpy. Then my hades stringer which was an attempt to make it look more deliberate balled up on me. Not a success, and this is a cautionary tale that sometimes the kitchen sink approach just gives you unexpected fugly! Annoyingly, this one probably has the best puckered bottom end… (The shape on the second one looks good, but it tapers a little too thin for a pucker). 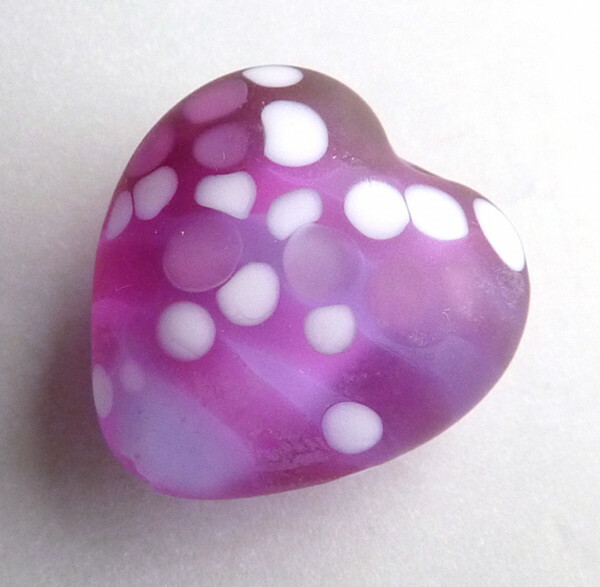 Something a bit different: theme of the month for February is Dots, so here’s an etched dotty heart. White core, dark lavender encasement, Reichenbach pink lady stripes and filling out of one lobe. White dots on the surface with pink lady on top of some of them. I made it too long for the press, but could use the lobe end to shape the top anyway. Then I etched it and I think it’s very pretty. Shame the bottom end is just slightly chipped after cleaning – getting the ends neat on these is definitely a challenge. I got back from Venice and the first thing I tried out was using my Carlo Dona press. On a hot head it takes a long time to get enough glass on your mandrel to fill this press! 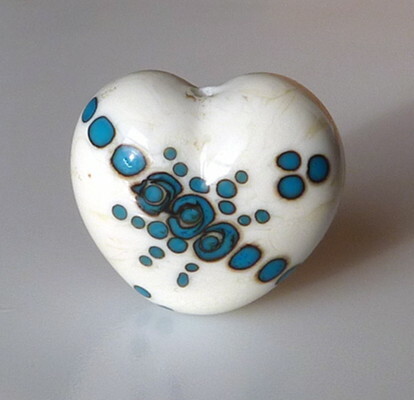 He makes them in different sizes – I forget the measurements, but mine’s medium-to-large and the whole thing is a fairly puffy 3D heart. The tornado bead above I didn’t quite fill it fully and it’s a bit uneven, but I like the effect. I used transparent dark purple for the tornado so it was saturated enough that it would show up. I made one in light ivory next so it would be faster to melt down. There was something of a washing machine disaster halfway through, which meant I had to stick it in the kiln when I was still building up enough glass. Washing machines are scary when the drum axle breaks when the machine is still on and has a spin cycle to go through… It was leaping about and shaking the entire room! 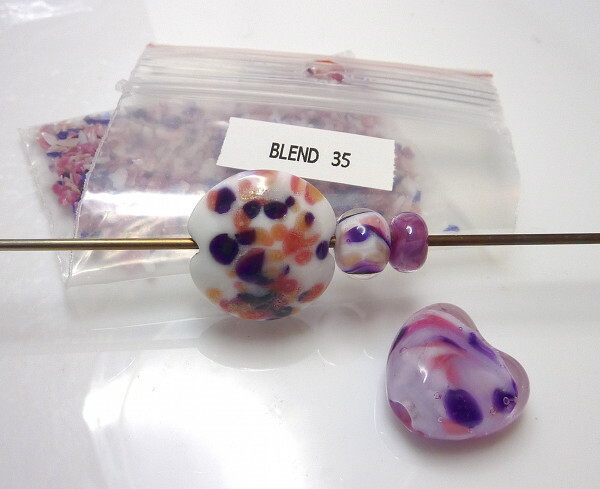 I was rather shaken after that and just made a couple of fairly plain beads to calm down, so in the morning I still had my large ivory blob on a stick. Pat from FH reminded me that I could bring it up to temperature again in the kiln the next day, introduce it to the flame carefully and keep working on it, so I did just that. I messed it up a bit by using dark turquoise and getting the dots on the front too hot so they reacted messily, but I am pleased I rescued it! The back’s a bit neater. I made an end-of-day heart next, using bits and pieces of green shorts I had lying around. It has a SIS shard on top. I did make the mistake of making one of the central colours be CiM kryptonite and it didn’t like being encased so deeply by the others. So this has a crack down the centre that only goes through the kryptonite and doesn’t reach the surface. 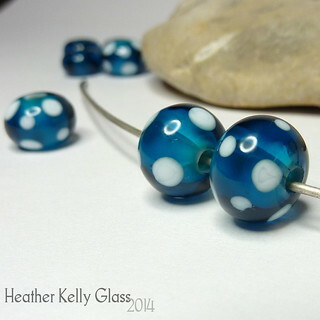 I do like this bead and I like the slightly random way of using up shorts. You’re not going to get the same thing twice! CiM sangre, encased and with murrini on top. This was going to be a tornado, but I made the wraps too thick and then when I pressed it the effect got too squished. More sangre. This has a black, white and red murrini from Kaz, and a MCD + hades twistie design that looks like a snake. Tornado lentil with CiM electric avenue and murrini. 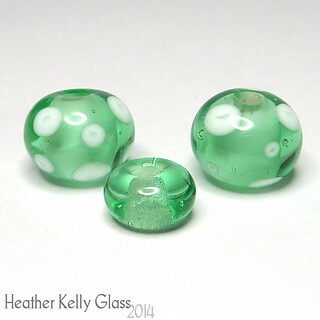 A small set with a CiM dirty martini base and a Cheeky Frit Blend called Dizzy. Dirty martini works well as a base for all kinds of things. Lastly, some spacers in a number of Cool Colours and odds. 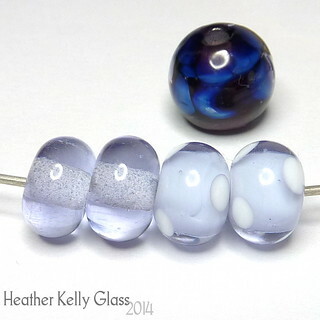 Back: blueberry marble, Vetro cosmic storm, Vetro purple plum with dirty martini dots. Front: kiwi. Cosmic storm is lovely and has little sparkles in it. Purple plum is incredibly soft and soupy. Blueberry marble and kiwi are two of the Effetre Cool Colours – pretty striations when you just use them on their own. Again I start with the frit over white, over white and encased, and frit painted. This is lovely. I like it better encased as I tend to frizzle the pinks if they’re on the surface. 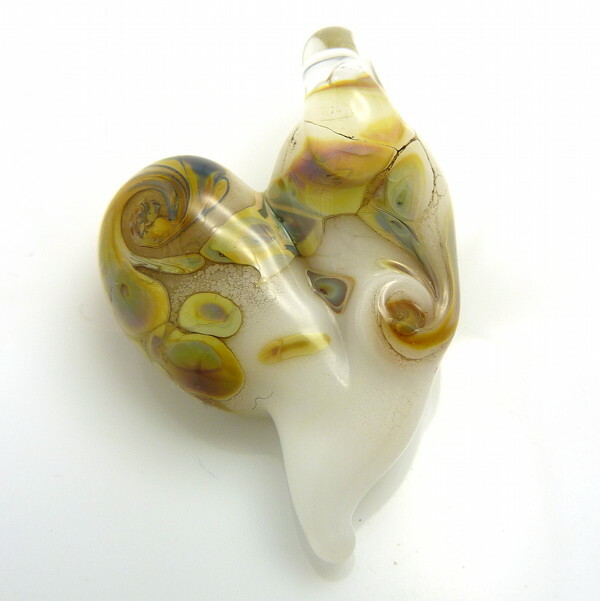 Really pretty on its own, and the frit painting one is gorgeous. 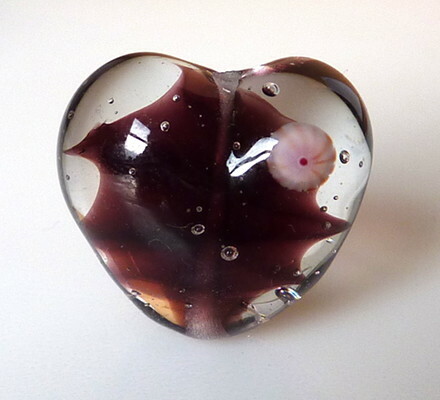 The heart is a base of CiM heffalump, and it’s encased in Effetre rose quartz. Hand-shaped as I don’t have a heart press… yet! Here’s another view of the heart. This is a BHB that I encased badly (again in Effetre rose quartz). It has a little ink blue in it too. Aaand I tried another heart! Over CiM kryptonite this time, encased in clear. The shape’s not quite as good.